CompTIA Security+ SY0-501 is a popular certification within the IT field. One IT hiring manager told me that if a résumé doesn’t include the Security+ certification, or a higher-level security certification, he simply sets it aside. He won’t even talk to applicants. That’s not the same with all IT hiring managers, but it does help illustrate how important security is within the IT field. CompTIA Security+ SY0-501 is one of the options for certifications required by the U.S. Department of Defense for military personnel and military contractors engaged in information assurance activities. Having this certification makes you more marketable for these types of contractor jobs, which can be very lucrative. Test mode – 75 random questions. View 75 random questions from the full test bank similar to how the Security+ exam has a potential maximum of 75 multiple choice questions. In test mode, you can only see the correct answers and explanations after you complete the test. Click here to see how test mode works. Since CompTIA began adding in the new performance based questions, they rarely give you the maximum number of questions. Instead, you can expect to get somewhere between 70 and 90 multiple choice questions and between three and ten performance based questions. You have 90 minutes to complete up to 90 questions. This gives you about one minute per question. Don’t let this scare you; it’s actually a good thing. With only about a minute to read and answer a question, you know the questions can’t be very long. The exception is the performance-based questions, but you’ll only see a few of those. The exam objectives are divided into the following domains, or general topic areas. Your exam may have some beta questions. They aren’t graded but instead are used to test the validity of the questions. If everyone gets a beta question correct, it’s probably too easy. If everyone gets it incorrect, there’s probably something wrong with the question. After enough people have tested a beta question, CompTIA personnel analyze it and decide if they want to add it to the test bank, or rewrite and test it as a new beta question. The good news is that CompTIA doesn’t grade the beta questions. However, you don’t know which questions are ungraded beta questions and which questions are live questions, so you need to treat every question equally. All that is required for you to take the exam is money. Other than that, there are no enforced prerequisites. However, to successfully pass the exam, you’re expected to have “at least two years of experience in IT administration with a focus on security.” If you have more than that, the exam materials will likely come easier to you. If you have less, the exam may be more difficult. There isn’t any guaranteed path to passing the Security+ SY0-501 exam. However, the following steps outline the path that thousands of people have used to add the Security+ certification to their resume. Get a good study guide. 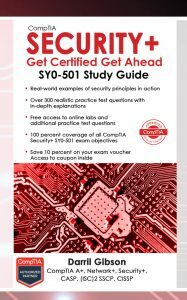 The CompTIA Security+: Get Certified Get Ahead: SY0-501 Study Guide has a wealth of practice test questions and gets great reviews on Amazon. Set a goal 45 days out from the day you receive your study guide. Buy your voucher for your target date. You can get a discount on your voucher here. Schedule your exam for your target date. Only use practice test questions with explanations. You can use the questions from the study guide or supplement them with other sources. A target of 45 days allows you to master about one and a half chapters per week. It may be that some of the chapters take you less time and some of the chapters take you more time. No problem. If you want to modify your target date later or reschedule your exam, do so. However, a recipe for success in almost any endeavor includes setting a goal. When using practice test questions, it’s important to use practice test questions with explanations. Practice test questions without explanations are often incorrect causing you to memorize false information without understanding why. Practice test questions with explanations allow you to understand the reasoning so that you can correctly answer the questions no matter how CompTIA words them. You’ll see the performance-based questions first and they take much longer than typical multiple-choice questions. If the answer is clear to you, then take the time to answer it. However, if the question isn’t clear, mark the question and skip it. You can come back to it later. It’s entirely possible that the question is a poorly worded beta question that doesn’t even count. However, if you spend 45 minutes on it, you might run out of time before you finish the multiple-choice questions. Performance-based questions have occasionally caused problems for the test systems. A common problem is that instead of displaying the question, the screen is mostly blank. If this happens, you can often just use the reset button for the question. This allows you to move past the problem and continue with the test. However, resetting the question erases any answer you’ve entered, so you’ll have to come back to it after you finish other questions. It’s common for people to be nervous when thinking about these performance-based test questions. However, most people who take the test say that these questions usually aren’t that difficult. If you understand the concepts from the exam objectives, you won’t have any problem. I do recommend you check out the posts on performance-based questions that I’ve posted here.